The Feelfree Lure is a super-slim and super-long fishing kayak that is one of the faster and most efficient kayak that we have ever reviewed. While it does lack in unique features, it has a brilliant empty space in front of the seat that allows for great standing room. 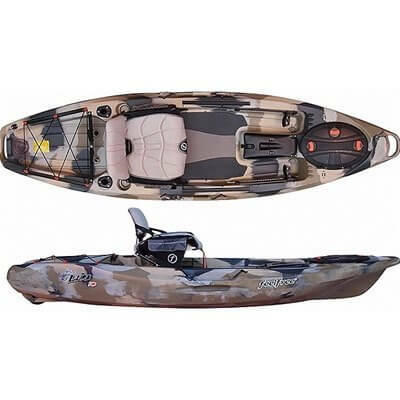 This is something that does set it aside from other kayaks and while the price tag is slightly high in our opinion, we do think that sporty anglers will love this kayak and we wholly recommend it. Read on to see if this is THE fishing kayak for you. If you had your eye on the Feelfree Moken but were put off by the speed, the FeelFree Lure could be the kayak for you. This kayak is not fast at all and instead is very stable and has good maneuverability. The kayak looks like it is built to last, with visibly strong materials going the kayak an overall feel of being good quality, without it being sound over substance. If you are thinking about buying this kayak but are not sure if it is the right choice for you, read our review. The Feelfree Kayak has an overall capacity of 375 pounds and is great for anglers who are tall or who are carrying more weight. The designers have built this kayak to be very stable, coming in at just 10 feet with a 36 inch beam. This means that this kayak is suitable for those just starting out in kayaking or who enjoy a slower pace of fishing. Coming in at 69 pounds it is relatively heavy compared to some other fishing kayaks and those who are not very strong may struggle to manage the kayak easily. We would say that you are likely to need to help to move the kayak any significant distance or when tying to your roof. Sit On Top Kayaks offer great stability and are easy to paddle for everyone including novices, right through to expert paddlers. In addition, these types of kayak can be used mainly on calm waters, but some models allow for rougher terrains. This type of kayak is different from other types of kayak as it does not have a cockpit and the hull has a self-bailing drain holes. The hull of sit on top kayaks has a double wall to trap air inside of the hull making them impossible to sink. It is not difficult to get on and off these kayaks, making them perfect for beginners. At around 15ft, sit on top kayaks are very stable although they should only really be used in calm water. The first design feature that you will notice on this kayak is the generous cockpit area that allows for a good standing space. The first thing that we have to say about this kayak is that we absolutely LOVE that we can stand up in this kayak without fear of tripping over. So many kayaks are built with a protruding storage space or console, that get in the way when we are concentrating on a big catch. If you are an angler who gets excited when in the throws of catching a fish, you will not want to have to think about what is under your feet. The free space in this kayak is very much welcome. Of course, this does have its downsides, in the fact that the kayak is a little spartan in certain areas, but we love it nonetheless. As well as good standing room, everything that you will need is in easy reach and there is even a comfort padded cushion to stand on, so that you feet can be as comfortable as possible when standing up. We think that this will be particularly advantageous in cold weather conditions. This kayak is a sit-on-top model but has molded sides that make you feel secure and comfortable. There is no fancy seat in this kayak, although it is reasonably comfortable for anglers of all sizes. We would have preferred the seat to be adjustable, to an adjustable backrest at least but nevertheless we have no really qualms. The foot braces, however, are adjustable so that taller anglers can customize for optimum comfort in the leg areas. There is a center console that has a hinged lid and offers good storage space for fishing finders and other important equipment. There are also extra places to mount equipment and there is enough there could be a little more, in our opinion. Despite the center console being an adequate size it does not interfere with the standing room, as we talked about earlier. Feelfree Lure has a unique ‘Uni-Track’ system so that you can customize your kayak to suit your needs, fitting all of your equipment in the most convenient spaces. A neat little idea indeed and one that will suit anglers who like to take as many gadgets as they can with them. The fact that the brand has spent time listening to feedback from anglers and those who have commented on previous models is obvious in the making of this very efficient kayak. This kayak is not all about what it looks and feels like, it has many innovative features, such as foot braces that you can adjust and adjustable seating. These features may not seem like the most important features but if you are a taller angler suddenly being able to get a few inches becomes greatly important. The Lure features rod holders and paddle keepers that are effective in securing your paddle when you are in throws of fishing. Sometimes it is the little things that make a difference when choosing a kayak and we have to say that Feelfree have shown good attention to detail. We mentioned that the Lure features a ‘Wheel in the Keel’ which is made of strong plastic and is mounted in the keel. This creative addition makes it easy to grab a hold of the kayak when you are transporting it and comes in particularly handy when having to launch the kayak. Again, this is a very small feature but when you have to manage to get a 69 pound kayak in the water it is a God send. There is good dry storage space and enough room for bait buckets and cool boxes, as well as additional clothing for those wet days. Whilst a lot of the features of this kayak are great, some very unique even, some people may not be sure if this kayak is worth the price tag, although the clear standing space is something we admire greatly. We realize that there are many more expensive kayaks on the market, but most of them stand out from the crowd and we are not sure if this kayak does enough to make it stand out, other than the very good standing space. We know that there are plenty of people out there who have different views than us, with many seeing it as a steal at the price it is at, so it really does come down to individual preferences. While we do have a few reservations about the price tag, as there are some other kayaks like this for a cheaper price. That said, while some other kayaks may have more features, the quality of the features that it does have are exceptional . The seating system is something that we would like to see on all kayaks, it is simply amazing. The standing room appeals as does the good storage space and standing room, so the only negatives in our opinion is the lack of speed. If you like short kayaks and prefer to fish in smaller waters, where maneuverability is essential, then we could not recommend the Lure more. We are fans of speed so it will never be the right kayak for us, but it will give novices the chance to feel secure whilst learning the basics and building up the speed over time. Overall, this is a very attractive kayak that does the job at hand and celebrates a good level of durability. Despite some of our minor qualms, we are sure that after reading this review you will have seen the many benefits of this kayak and it will allow you to enjoy many happy fishing days.